Evidence of cannibalism among Neanderthals has been uncovered before, like these bones with cut marks found in a cave in Goyet, Belgium. Image: Asier Gómez-Olivencia et al. Neanderthals are famous for having lived through the last major ice age, yet for a period of around 14,000 years they had to endure the effects of a naturally occurring global warming cycle. Struggling to adapt to the changing conditions, the Neanderthals turned to cannibalism in desperation, according to a provocative and timely new study. New research published this week in the Journal of Archaeological Science suggests the crushing impact of the Last Interglacial Period, also known as the Eemian period, forced Neanderthals into cannibalism. This era of prehistory, between 128,000 to 114,000 years ago, saw global temperatures rise to about 2 degrees Celsius higher that the average global temperature in the 20th century. The archaeologists who authored the new study, Alban Defleur and Emmanuel Desclaux from French National Center for Scientific Research, presented new evidence showing how the sharp spike in temperature reshaped the Eurasian environment, and by consequence, the animals upon which the Neanderthals depended. Warmer conditions might sound like a welcome respite for the Neanderthals, but the change was likely very disruptive. Neanderthals had lived in Eurasia for hundreds of thousands of years prior to the Last Interglacial Period, and they were well adapted to the ice age conditions. The resulting changes to the plant and animal life were not necessarily for the better, as far as the Neanderthals were concerned, though archaeologists and anthropologists would be the first to admit that very little is actually known about this 14,000-year period in terms of how the Neanderthals fared. The new research is important in that it synthesizes old and new evidence to show that the Eemian period was not a good time for Neanderthals. 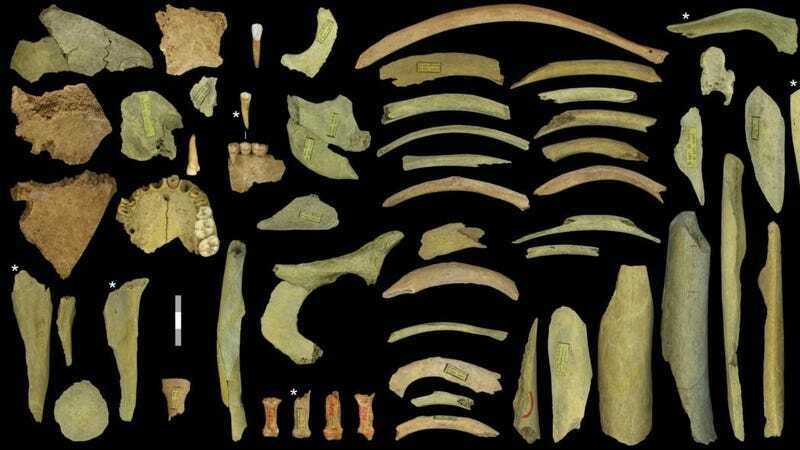 For the new study, Defleur and Desclaux evaluated Neanderthal remains and other evidence, such as sediment, charcoal, and animal remnants, gathered from Baume Moula-Guercy, a cave near the village of Soyons in southeastern France. Some of the Neanderthal bones collected in this cave, which were discovered in the late 1990s, exhibited signs of cannibalism. The authors also reviewed the existing scientific literature pertaining to this cave and the environmental conditions during the Eemian. At least six Neanderthal individuals found in the cave—two adults, two teens, and two children—were cannibalized, as evidenced by cut marks made by stone tools, signs of complete bodily dismemberment, and finger bones exhibiting chew marks made by Neanderthal teeth. Evidence of cannibalism exists throughout much of history, but it’s notoriously difficult to discern the exact reasons for the practice in each case. A 2017 study published in Scientific Reports showed that cannibalism is not the most effective way to acquire calories, and that ritualistic practices played a significant role in the behavior. That’s all fine and well, but eating your own kind as a means to acquire sustenance during times of nutritional stress cannot be ruled out in some cases, and is cited as the reason for the observed cannibalism in the new study. That Neanderthals engaged in cannibalism is not a total shocker. Examples of this behavior among this group have been uncovered before, including signs of cannibalism on Neanderthal bones found in Belgium. That said, Kurin said there isn’t enough evidence to support the assertion that Neanderthals practiced ritualistic cannibalism, such as during funerals. And in fact, the trauma patterns described in the new study are more consistent with nutritional cannibalism, she said. ...tropical or temperate forests are hostile living environments for all hunter-gatherer groups today, as in the past, because protein from medium-sized [hoofed mammals] is much less than from prey found in an open Mammoth steppe formation. Based on study of the human teeth, this population was subject to frequent nutritional stresses and the presence of cannibalistic behavior which, unlike ritual burial practices, is the exception for European Neanderthals. The population subsequently collapsed during the Eemian, according to Defleur and Desclaux, and the paucity of Neanderthal remains and artifacts from the Eemian is further proof of this. As the paper pointed out, the Neanderthal population was never high to begin with—there were never more than tens of thousands of individuals at a time. Neanderthals lived in small groups consisting of around 15 to 25 individuals at most, so further population declines were likely catastrophic. Kurin said the authors presented a convincing argument. Neanderthals, she speculated, could have practiced cannibalism as a way to survive prolonged periods of food insecurity or desperation. Among human groups in more recent history, eating the flesh of an ancestor was part of the grieving process that enabled the dead to pass onto an afterworld, said Kurin, while at the same time helping living descendants cope with the loss. “Eating the flesh becomes a way of remembering the dead,” she said. An interesting idea, but for now there’s no evidence that Neanderthals held any such beliefs. As Defleur and Desclaux were apt to point out, the finds at Baume Moula-Guercy represent an isolated episode, so we need to be careful about generalizing this example to other Neanderthals. Archaeologists should continue the search for more evidence dating back to the Eemian period to find other potential examples. Regardless, it certainly appears that climate change took a serious toll on the Neanderthals, in what is clearly a cautionary tale for the modern era.